I want to shout it from the rooftops. I can’t stop eating poblanos! It’s embarrassing how easy these little peppers are. I’m embarrassed to show them to you. Embarrassed to even talk about them because they just… seem… so… simple. And they are. But some times I find that I gotta share these little simple things that taste so good to me, even if I have the weirdest taste buds ever right now, because things don’t ALways need to be trashed up. Errr, well, the kinda do. I’d love a world where they do. I’m not a gigantic fan of traditional stuffed peppers – probably because of the tomato sauce – but I make them for Eddie a few times a year and they are totally one of his all-time favorite things. 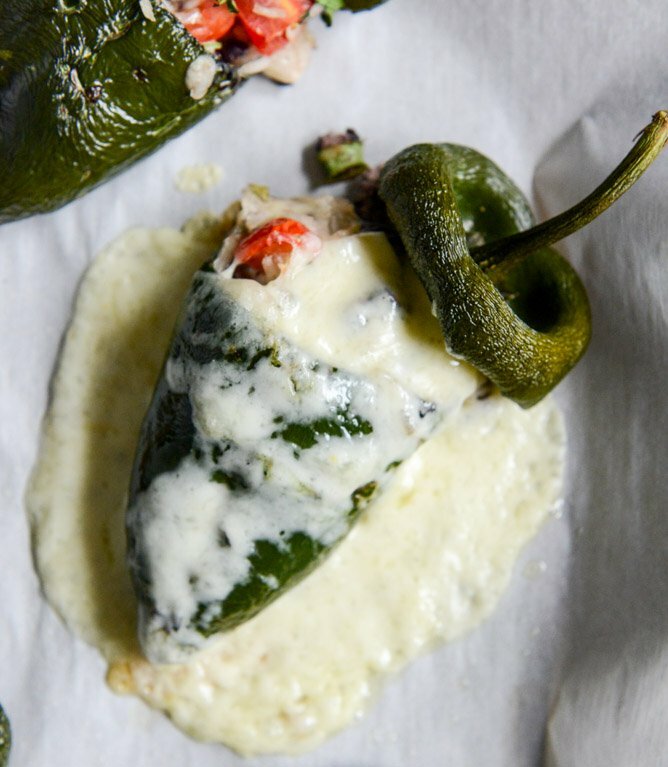 What I can get behind are these poblanos… mostly because I go crazy over poblanos and just think they taste BETTER than green bell peppers, but also because I stuffed and then smothered them with cheese. And other delicious things like jasmine rice (ugh so good) and black beans and stuff like that. And they make the most perfect side dish OR dinner OR snack, depending on if you’re into that kinda thing. So we haven’t really had a crazy heat wave yet. Not one of those omg-it’s-so-hot-I-can’t-bear-to-turn-on-the-oven heat wave. Like maybe one or two days at 90 degrees. Which is completely awesome for the people in my life because I have been bratty and complaining. AND it means that I can still turn on the oven and it’s really no biggie. Plus, I had a good four week run of caprese salad every night where I was like oven? What’s an oven? This was a welcomed change. Um and can we talk about how I’m going to make these later this week again and grill them? You should probably do that. And let’s add grilled corn! Why not? Preheat the oven to 425 degrees F. Slice the tops off of the poblano peppers and remove the inner ribs and seeds. Rub the outsides and insides with olive oil and sprinkle with a pinch of salt and pepper. In a bowl, mix together the rice, beans, cheese, tomatoes, cilantro, green onions and garlic. Add in the salt and pepper. While mixing, I sort of mashed everything together with the beans so it stuck. Stir in the sour cream until combined – helping to hold things together. Stuff each pepper with the rice and bean mixture. Place them on a parchment paper covered baking sheet. Bake for 25 minutes, then remove and add a few handfuls of cheese on top of the peppers. Bake for 15 minutes more. Serve immediately with salsa and avocado! I am the person that eats all the cheese off the baking sheet too. I have never tried poblanos before, but !! This looks amazing! JESS! are you coming to NYC? I have pre-ordered Seriously Delish and my fingys are crossed you will be coming my Manhattan way – let a sista know!!! Oh I am so making this this weekend!! Those look great, and I looooooooove eating the crispy cheese off of the pan! The stuffed pepper recipe of my dinner dreams! Wow! Yum! When’s dinner! Way to go! Can I have seconds! Hey can you tell I find these clever little guys wonderful! I used cubanelle peppers instead of poblanos and they were still delicious. Thanks for another amazing recipe! I just made these and they were delicious!! Thank you for the amazing recipe. Can’t wait for the next one! I fully intended on making this as directed, but the poblanos at the market looked pretty sad. So, I stuffed red bell peppers instead. 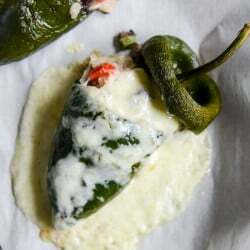 (I also added a couple diced jalapenos to the filling.) They were terrific, super easy, & the hubby loved ’em. Definitely making these again. Thank you! made these with hatch green chiles instead of poblanos, they were delicious! I made this a few weeks ago and am making them again tonight for a family Labor Day picnic tmrw – they are amazing! My first time cooking poblanos.. they are surprisingly spicy even after being cooked! Made these tonight! Delicious — I loved the roasted poblanos! Also the baked cheese on the cookie sheet was amazing! I’ve made these a few times, love them! Question, how well do you think the uncooked stuffed peppers would freeze? Have you ever tried it? thanks! I have not tried it, but I think it would work well! I’m wondering how your poblano peppers tasted without roasting them first? Ugh, these look soo delicious!! You should come to ND. We’ve been getting our heat wave this past week. Temps have been in high 90s and have gotten up to 101. Today is supposed to be the same…always happens when summer is almost over and we’re a week and a half from when school starts again.